Martina has registered copyright of her book with Copyright House. 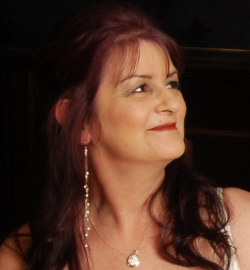 Martina is a dark comic author from Bolton. 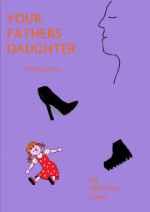 Her first book, entitled 'YOUR FATHERS DAUGHTER-The Early Years', is about her own childhood. As with most children she considered her upbringing to be a normal one. She learnt, as she reached her mid teens, that it was far from normal. Once she had realised this and challenged those with authority over her, the struggle to survive and escape alive began. Martina has been an avid reader and writer her whole life. As a child she read many books both fact and fiction, she even read a child's encyclopaedia from cover to cover! In school she always loved essay writing, but her mind worked so fast that her pen couldn't keep up! Martina told me that she, 'always lost marks for missing the first letter off most of my sentences'. She has also kept a diary throughout most of her life. Martina has published her first book very recently, 'Your Father's Daughter' (available on Amazon/Kindle), and admits that it took her three tries to find her own style. That doesn't sound bad to me Martina, some authors take years to find their style! Her first draft of Your Father's Daughter read like a list and the second became a boring monologue. From the mistakes she'd made in these first two drafts Martina worked out what she wanted to achieve and the final edition went into print. Martina tackles serious issues and adds a smattering of laughter and even a few belly laughs. She finds that the worst issues are remembered better if there is a laugh in there somewhere. Martina says she has been inspired by female comics such as Jo Brand and Victoria Wood. She drew inspiration for 'Your Father's Daughter' from Dawn French's, 'Dear Fatty', however Martina's book is far more serious. Martina already has an idea for a follow up book as well as several other ideas waiting to be put onto paper.